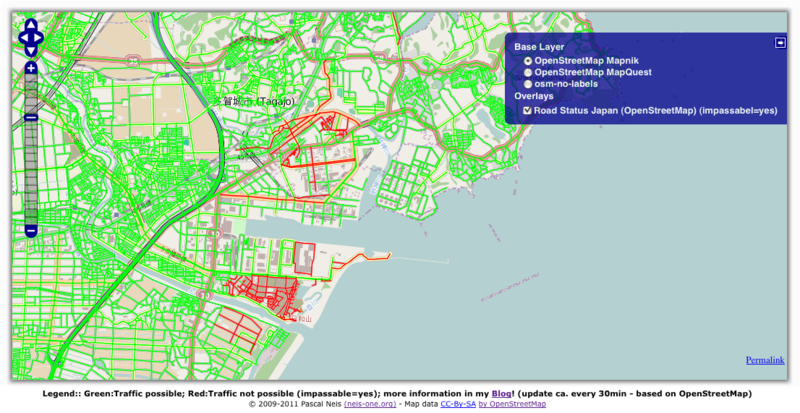 Road Status after the Earthquake in Japan based on OSM : Neis One! Yesterday, Bing Maps has announced a map for Japan, which shows the “Road-Status after the Earthquake”. The information seems to be from Honda (footer: “Status of Roads provided by Honda”). My first thought: with OpenStreetMap it is possible too! So here we go: The Geofabrik generates hourly new files for Japan (Sendai region only). It’s available here. I have written a small script that only gets the highways out of these files and after that I imported them in a PostGIS/PostgreSQL database. Finally they are available in a Geoserver WMS/WFS. Download OSM file from the Geofabrik Server: ca. 25sec. Generate an *.osm file from the *.pbf with Osmosis: ca. 40sec. Create and import WMS PostGIS table: ca. 25sec. The layer has only two colors: green and red. The green color symbolizes all the roads which can be used for traffic. The red color symbolizes the roads which have an “impassable=yes”-tag in the OpenStreetMap database and which can NOT be used for traffic! You can find further information about OpenStreetMap and the Sendai earthquake/tsunami in the OpenStreetMap Wiki. Additional information you can find in the German OpenStreetMap Blog. I hope this overlay is useful for some people! thx @ All OpenStreetMap contributors !!1! I’ve been mapping extensively and using barrier= tags to mark blocked roads on nodes. It’d be great to add those (maybe as red X’s) to this to incorporate more of the mapping information. Hi Andygates, thanks for your comment. Thanks for your nice map! Could you please add Japanese character strings for us Japanese as following? It would be very useful for us. The region of Sendai has lots of those. Basically, if you’re just interested in the impassable ways, you can map practicability=no to the same style you use for impassable=yes. thanks for the map. I would find a Bing Satellite base layer useful to find still unmapped places.